and the media coverage of events today has started. BBC Three Counties Dr John to be installed this week includes a handy section listing “all you need to know about the installation service for Dr Jeffrey John”. 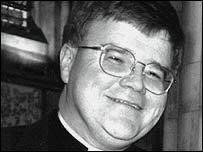 BBC News Gay cleric installed at St Albans. This currrently includes a link to the old video report from the day of the announcement of his appointment. Sky News has GAY PRIEST IS NEW DEAN and GAY DEAN: DO YOU AGREE? which invites comments from the public.